Cristina Scabbia is an Italian singer who is best known as one of the lead vocalists of the gothic metal band, Lacuna Coil. Scabbia has been with the band since its inception and has toured with them internationally. The band is known for her combination of gothic imagery and music as well as their prominent guitar lines creating melodies with a contrasting male and female vocal harmonies. 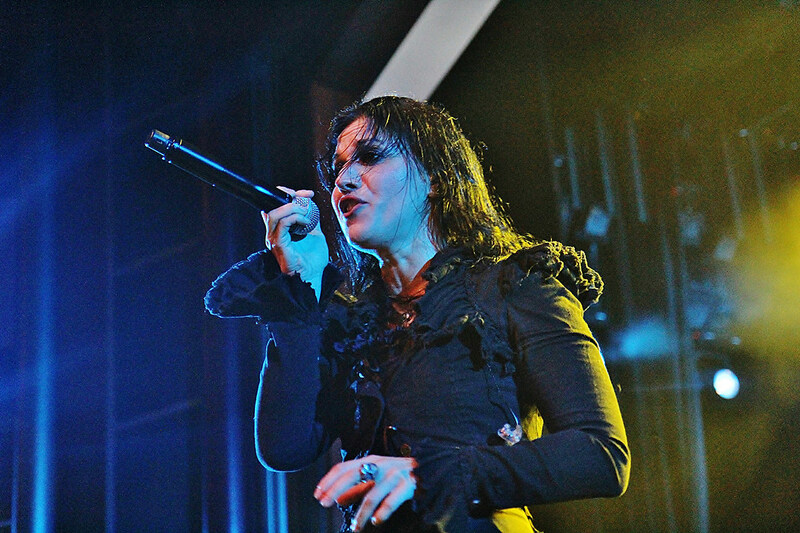 In addition to singing with her band, Scabbia’s powerful vocals have seen her feature in guest works alongside musical projects like; Ayreon, Alter Bridge, Rezophonic and many others. Here is a look at Scabbia’s journey to stardom with the band. Cristina Scabbia was born Cristina Adriana Chiara Scabbia on the 6th day of June 1972 in Italy. Blessed from birth with a very lovely voice, Scabbia began singing as a kid and went professional in 1991 at the age of 19. She began by singing backups and touring with already established bands. In the same year, her interaction with musicians brought her to cross paths with bassist/composer Marco Coti Zelati at Midnight club. She soon began dating Zelati who at the time was making plans to form a band alongside vocalist Andrea Ferro. By 1994 the men formed the band named Sleep of Right in Milan and employed Scabbia as their session singer. Scabbia at this time was asked to join the band as a co-lead vocalist as the entire band loved how her vocals sounded alongside Andrea Ferro’s. Lacuna Coil released their debut EP and began touring across Europe. Their debut studio album, In a Reverie was released in 1998, following their second European tour as support acts. With the release of their second album, Unleashed Memories in 2001, Lacuna Coil began touring in the United States as a supporting act for the Portuguese heavy metal band, Moonspell. Cristina Scabbia and Lacuna Coil got their first major breakthrough in 2002 with the release of their third studio album, Comalies. The band was featured in the TV series Uranium which brought them to more recognition in the US. The success of their third studio album brought about their first headlining tour later in 2003. Their single “Swamped,” from the album was used in two video games – Vampire, and Resident Evil: Apocalypse. Lacuna Coil has become one of Century Media’s most successful bands. They have since released at least 8 studio albums and were nominated for MTV Europe Music Awards for Best Italian Act 2006. In 2018, they won Metal Hammer Golden Gods Award for Best Live Act. Cristina Scabbia has never been married, thus, she’s had no husband, however, her longterm relationship with Slipknot guitarist Jim Root could pass for a marriage. The pair began dating in 2004 and managed a long distance relationship until 2017 when it all came crashing down. Read Also: Who are The Members of Halestorm, What are They Known for? Regular touring for Scabbia took an occasional toll on her romantic life prior to its ending. Throughout the period of their relationship, Root lived in Florida while Scabbia maintained her home in Milan, Italy. Scabbia, through a Facebook post in late 2017 sadly revealed her split from Root describing their 13-year relationship as the most fulfilling 13 years of her existence and heart. Unfortunately, the year she ended things with Jim Root was also the same year she lost both her parents within a few months. She revealed her loss in the same Facebook post where she described her parents as the two human beings she loved the most in the entire universe. She also credited their lifelong support with bringing her mainstream success. • In addition to singing, Cristina Scabbia is also a good writer and once wrote a column for the popular rock magazine Revolver. • Her relationship with bandmate Marco Coti Zelati ended in 2003, however, the two have remained friends and continue to work together. • Cristina Scabbia stands at a height of 5 feet 3 inches tall. • She has been said to hit the A7 note, her highest ever.